I thought I would share my pond with you today. It is a bright sunny day and perfect for sitting by the pond to enjoy the trickle of the water fall and the splash of the fish. The water lilies are blooming. Today the pond needs the filter washed out and the water level topped up, but this will only take a few minutes. 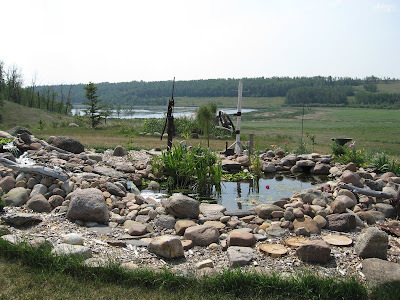 We built this pond ourselves and moved in many field rocks from around the rock piles and fields on the land. I have four fish this year, one gold fish and three koi.